California Creationz is comprised of three young, sophisticated, and talented partners. 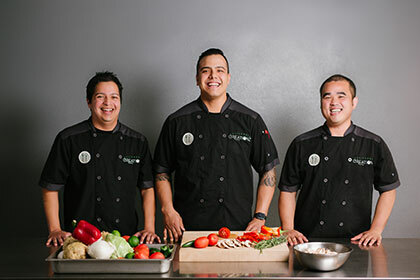 After working with each other at various establishments, the three men soon realized they all shared a passion for providing people with healthy, nourishing, and delicious food. Each partner brought something unique to the table and what emerged was the idea for an affordable service that provided fresh, convenient, and tasty meals to individuals and businesses looking for an easy way to eat healthy. Whether you are looking for meal delivery, corporate catering, or school lunches, the team at California Creationz is committed to offering a variety of options that won’t leave you hungry. For the men behind California Creationz, food isn’t merely a business - it’s their life and passion. They bring the same level of professionalism, accountability, and perfectionism to each customer, whether you are catering an office event or just need convenient healthy meals delivered to your home or work. Regardless of your needs, you are guaranteed remarkable service, delicious flavors, unique dishes, and unparalleled presentation. California Creationz has options available for any budget and takes pride in being able to work with many clients, from individuals to large corporate events. The team at California Creationz works hard to achieve their mission - to take the stress of planning off of your plate and replace it with fresh, convenient, and delicious meals.